Help us give back to the dance education community because... "It All Starts with a Dance Teacher"
#ThankADanceTeacherDay is a global movement to shine the spotlight on dance education and the teachers who make it possible. It was started in 2014 by the National Dance Education Organization to raise awareness of the benefits of dance education through social media. A quality dance education can have a life-changing impact on students, providing physical, social, emotional, cognitive, and psychological benefits. Professional development allows dance teachers to provide a better dance education experience for their students, as the teachers take what they learn back to their studios, classrooms, and communities! Thank A Dance Teacher Day is a program of the National Dance Education Organization, and in 2019 we’ve teamed up with CLI Studios to help spread the word and recognize the importance of dance teachers in the lives of their students. NDEO urges dance enthusiasts of all kinds (dancers, former dancers, current students, teachers, dance dads & moms, fans, etc.) to participate in Thank a Dance Teacher Day by donating to NDEO in honor or memory of their dance teacher and sharing their story on social media. 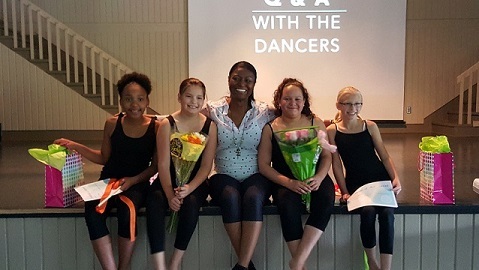 2019 Thank A Dance Teacher - Donate Now!